Teresa Corrigan scans the dozen or so people attending her Laughter Yoga session in San Francisco. She tells us it’s time to warm up. “Everybody say, ‘Ha-Ha-Ha. Ho-Ho-Ho,” she demonstrates, and begins to laugh. Corrigan is a registered nurse and certified Laughter Yoga teacher at the UCSF Osher Center for Integrative Medicine. She leads this free session twice a month. I put on a fake smile and force out something I hope sounds like a chuckle. This is ridiculous, I think, glancing at the woman sitting next to me. We make eye contact and she meets my “hee-hees” with some “ha-has.” The corners of my mouth began to twitch. The laughter from the dozen other participants echoes through the large room. Suddenly, I couldn’t help myself; my giggles got the better of me and I began to howl. Laughter yoga promotes self-induced laughter, a "fake it ‘til you make it" strategy that’s meant to mimic real, deep belly laughs. Corrigan tells us to place our hands on our stomachs to make sure the ha-ha comes from the diaphragm, not the chest. “You ask people to laugh with you and they say, ‘You’re out of your mind!’” Corrigan managed to say between bursts of genuine laughter. “That’s exactly it. We are out of our minds.” She taps her index finger to her temple. 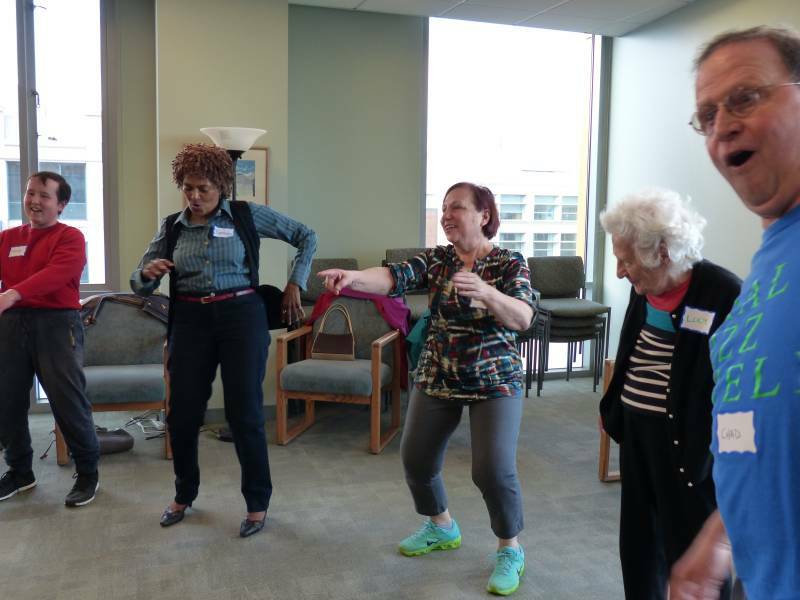 Corrigan has been leading Laughter Yoga at the Osher Center for more than seven years. The free sessions combine breathing, stretching and group laughter exercises to help UCSF patients and the public cope with stress, deal with pain and improve their physical health. The idea's not an April Fool’s Day prank; research shows vigorous laughter is associated with relaxed muscles, enhanced circulation, and improved respiration. It may even boost the immune system. Our brains are wired to communicate via cackling. Laughter played important role in human evolution, a way to create and maintain social bonds. No one taught us how to laugh—children begin laughing around 4 months old, long before they start telling you knock-knock jokes. Other species communicate with laughter, too. Gorillas, rats, chimpanzees—even dogs—make laugh-like sounds during play to signal that it’s all in fun; it’s not an attack. Provine, a professor of psychology at the University of Maryland, Baltimore says this distinctive in-and-out breathing pattern evolved into the familiar human chuckle. “The ancestral pant became the modern ‘Ha ha,’” he says. It was that very association with the unrefined part of our nature that caused Plato to criticize laughter. “He was warning against the dangers of laughter because it was the unrestrained expression of our animal self,” said Provine. All cultures in the world have laughter and despite some differences, Provine says, humans can always recognize when it’s happening. That’s because it has an underlying structure: a single short burst of ‘Ha,’ that lasts about a fifteenth of a second and repeats every fifth of a second. Research has shown we can even distinguish a fake laugh from a real laugh. Try laughing on command—it’s tough. When you really get that gasping, knee-slapping, stumbling guffaw, your whole body is laughing. First, the muscles around your rib cage contract, squeezing air out of your lungs. It rushes through your windpipe and vibrates your vocal chords; thus the honking, the cackles that tumble helplessly out of your mouth. Exhaling more than you inhale, an alarm bell rings: low oxygen alert! The heart rate and blood pressure speed up temporarily to deliver the blood you need, then drop back down. They may even go lower than before you started laughing. In your face, the muscles around the eyes and mouth twitch uncontrollably. Incidentally, these facial movements can also cue others to mimic with their own face, which is why some laughter can be contagious. Research has shown that just hearing laughter lights up the part of the brain that prepares the face muscles to get moving, indicating that we’re wired to share our laughs with others. With the face tensing up, the rest of the muscles can relax. Have you ever stumbled around laughing, as if you were drunk? Though research shows associations to health benefits, there’s no direct evidence that the laughter itself is responsible, Provine says. Future studies need to do more to isolate the other factors, like being in a social group, to nail down what role laughing plays in health. Corrigan conducts informal questionnaires that ask participants to report their stress and pain levels before and after the class. In just one hour, people report having up to 50% reduction in stress. It’s not rigorously scientific, but it’s enough to continue to get funding every year. Laugh for Laughter’s Sake. It Feels Good. Laughter Yoga is an import from Mumbai, India, developed in 1995 by physician Madan Kataria and his wife Madhuri, a yoga instructor. 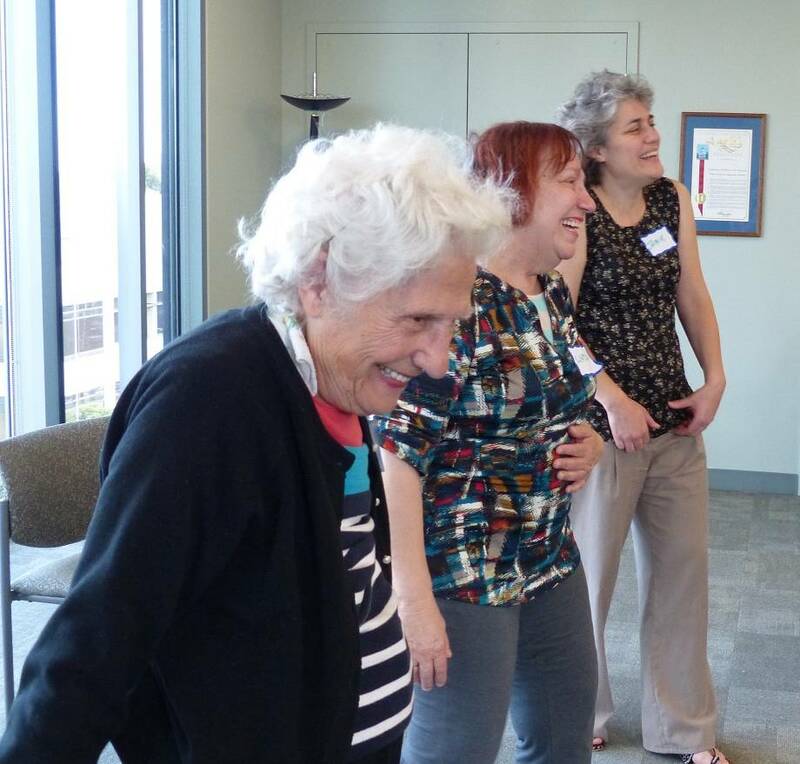 The Katarias launched Laughter Yoga International and train instructors to start their own laughter clubs—that’s one of the places where Corrigan studied. Kataria says today, there are more than 16,000 laughter clubs in 105 countries – about 500 of which are in the United States. Corrigan discovered laughter yoga at a friend’s party years ago, and something clicked. “I was suffering from terminal seriousness. Life got really hard for a while,” she said. She knew it could be a powerful tool for patients at the Osher Center, and recently began doing one-on-one visits to people at the UCSF Medical Center to sit with them and laugh. “I’ve never seen anything so powerful. Some people will start crying and say, ‘I haven’t laughed like that in years,’” she told me, her own tears brimming.